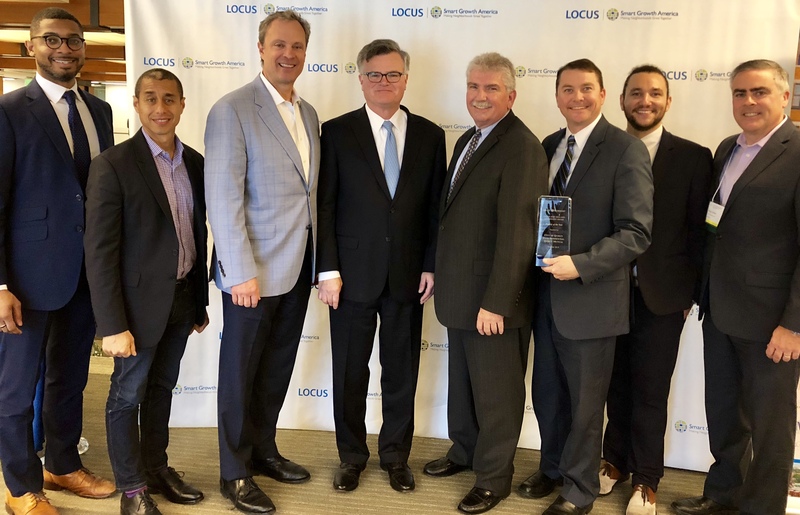 Left to right: Christopher Coes, Director of LOCUS; Jair Lynch, President/CEO of Jair Lynch Real Estate Partners and President of LOCUS; Jim Goldenberg, Principal, Cathartes; Doug Landry, VP for Real Estate Development at Tighe & Bond and President of LOCUS Massachusetts; Elijah Plymesser, Director of LOCUS Massachusetts. 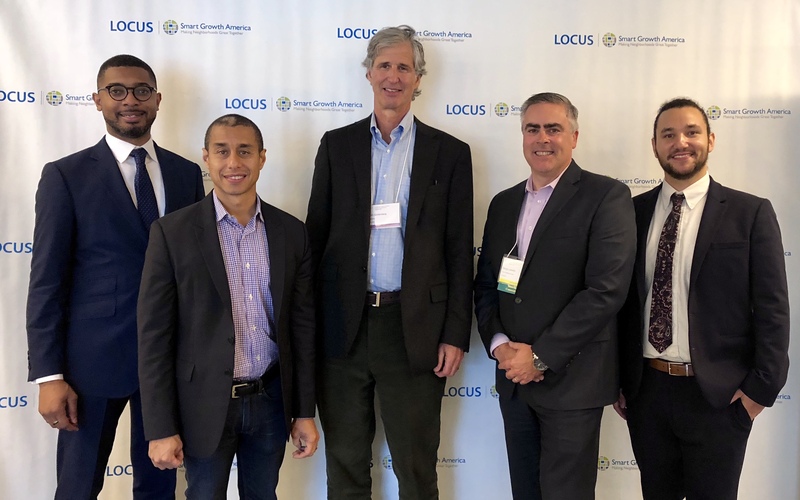 Last week developers, investors, planners, and other real estate professionals convened in Boston for the 2018 LOCUS New England Leadership Summit. The summit covered the future of development in New England, touching on topics from planning for resilience to regional opportunities with the new federal Opportunity Zones program with government officials—like keynote Jay Ash, Massachusetts Secretary of Economic Development and Housing—and developers. The event attracted over 130 attendees. 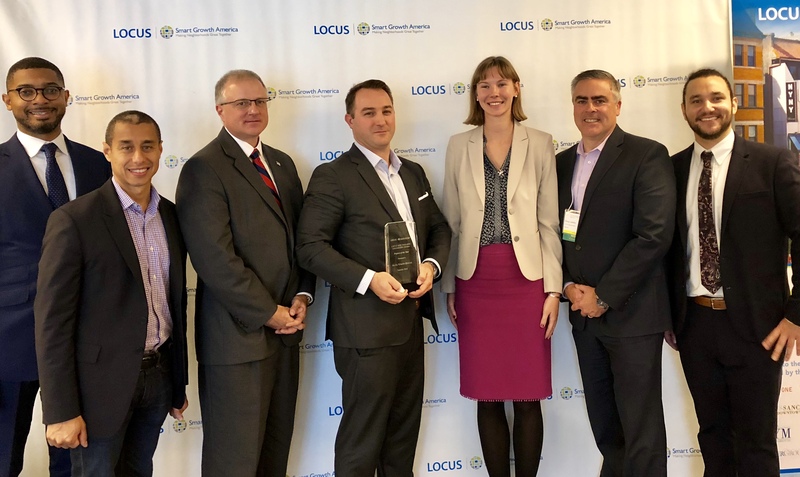 The Summit also served as an opportunity to announce the winners of three 2018 LOCUS New England Leadership Awards, recognizing a developer, project, and partnership that exemplifies smart growth development approaches including transit-orientation, walkability, collaboration, and public-private partnerships. Alta Union House is a mixed-use, transit-oriented development in the heart of downtown Framingham, MA. The high-quality construction and thoughtful site design of Alta Union House creates a new anchor and promises to attract new residents and investment to downtown. The 60 million dollar project scheduled to open in 2019, is situated within walking distance to the Framingham commuter rail line, allowing residents easy transit access to Boston. Left to right: Christopher Coes, Director of LOCUS; Jair Lynch, President of LOCUS; Arthur Robert, Framingham Director of Community & Economic Development; Jim Lambert, Director at Wood Partners; Moira Cronin, Development Analyst at Wood Partners; Doug Landry, President of LOCUS MA; Elijah Plymesser, Director of LOCUS MA. This Boston-based firm earned the award for their excellence in creating walkable communities around the northeast, such as Portwalk Place (Portsmouth, NH), Harborwalk (Plymouth, MA), and Fort Point Place (Boston, MA). Their portfolio includes a diverse range of property types linked by their dedication to work-life balance, wellness, sustainability, and community engagement. Over a decade ago, an out of state developer was selected to implement a vision for Quincy, MA’s downtown revitalization. Due to the 2008 recession, that vision unfortunately never came to fruition. The city was left with a hole in the ground that languished for years until a local institution—Quincy Mutual—stepped in to provide the capital needed to finally realize the city’s vision. Redgate served as a strategic advisor to the city as the project restarted, lending their development expertise in creating a plan to attract new development, engaging key stakeholders, and directing significant public infrastructure investments. The project, West of Chestnut, helped catalyze residential development in other downtown areas, all of which take advantage of the MBTA’s four Red Line stations. West of Chestnut and the overall vision for Quincy was an undertaking that couldn’t have occurred without the deep partnership with Quincy Mutual and Redgate. Each of the three partners shared this award. LOCUS and Smart Growth America would also like to thank the Barr Foundation for their continued support of their work in New England and on the national level.